Pixel Film Studios brings users another amazing compositing tool with ProBeam for Final Cut Pro X. Add the subtle but enveloping light beam effects to any shot, enhancing the mood within seconds. With 30 different presets including on-screen direction and distance controls, full color options, and added composite elements, PROBEAM is sure to enahnce any film. ProBeam from Pixel Film Studios comes with 30 presets allowing users to create new environment composites with ease. Each preset can be changed to match the scene with all the necessary controls any user could want! From a novice to expert, this tool can work for any film maker. 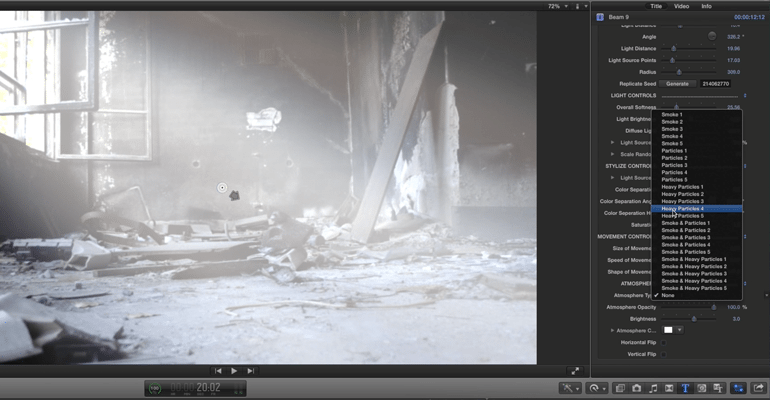 ProBeam helps users add light effects and composite elements enhancing any shot. Whether its a simple infomercial of the latest extreme sports documentary, these light beams will take the films elements to the next level. Controlling light beams has never been easier in FCPX. ProBeam includes all the controls users need to adjust light angles, ray widths and gleam speeds, along with the color controls to match any light source. 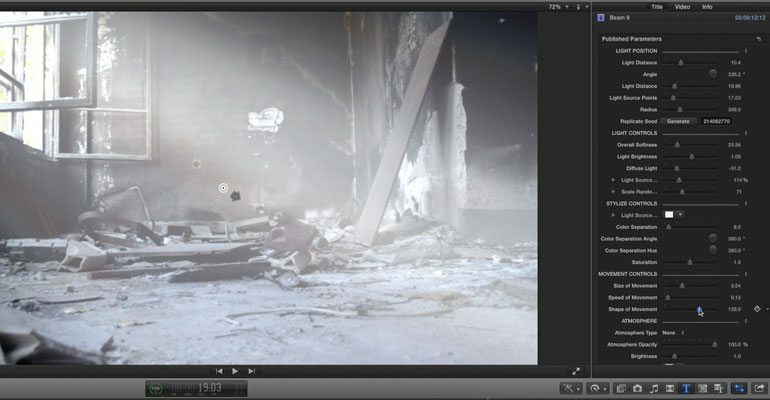 ProBeam was designed as a useful compositing tool for Final Cut Pro X. On-Screen controls help the user decide which direction the light should point, as well as the light distance. Color and element controls are located in the inspector window allowing users to jump in the drivers seat and begin enhancing their film with ease. Learn how to add epic or subtle beams of light to your film with the ProBeam Lesson from Pixel Film Studios. 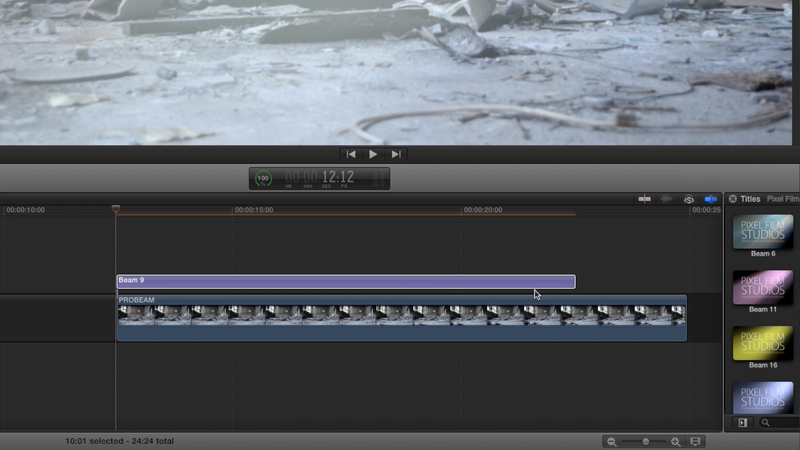 Let's begin by selecting a clip in the FCPX media library and dragging it to the timeline. This effect works best with steady shots that have little to no movement. Once, you have your footage in the timeline, go to the FCPX titles library to locate the ProBeam presets. Scan through the light types and select the one that best matches the look you want. Then, drag the adjustment layer above your footage on the Final Cut Pro X timeline and make it the same length as the clip. Once you have the timeline setup, let’s position the light to where we need it. Select the adjustment layer in the timeline. Then use the on-screen control in the viewer window to adjust the angle and distance of the light. Now go to the FCPX Inspector window. Use the light distance slider to adjust the depth of the light beam in the scene. Then use the light source points to adjust the strength of the light. Finally, use the radius slider to control the horizontal spread of the beam. Now that we have our beam where we want it, it’s time to customize the quality and color of the light. Go to the Light Controls section in the Inspector. Use the overall softness slider to make the individual beams more or less noticeable. Then use the diffuse slider to further adjust the horizontal spread of the beam. Next use the Light Source Scale and Scale Randomness sliders to adjust the size of the beams. Now scroll down to the Stylize Controls. Use the color picker to change the main color of the beam. Then use the color separator slider to give the impression that light is passing through a prism. Finally use the saturation slider to adjust the overall color intensity of your beam. Now that we have our light looking the way we want it, let’s adjust the movement settings to give the illusion that there are objects passing in front of the light. This is a great way to create light passing through water or branches. Use the movement size, speed and shape sliders to your liking. Now for some Final Touches. Let’s adjust a few more parameters to fine tune our ProBeam. Scroll down to the Atmosphere controls section. 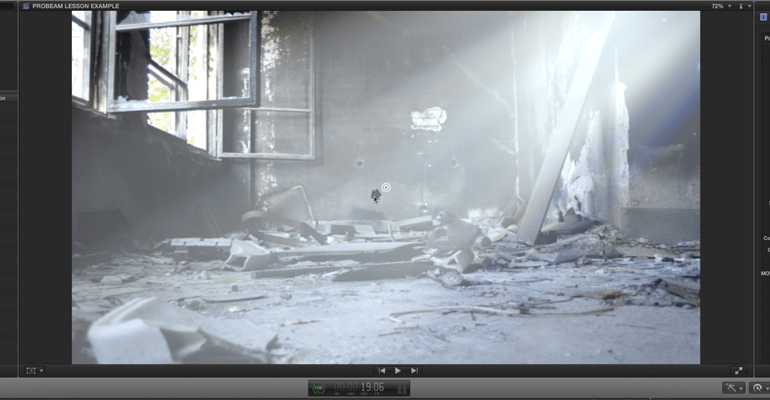 Use the Atmosphere Type drop down menu to add some smoke or particles to the light. 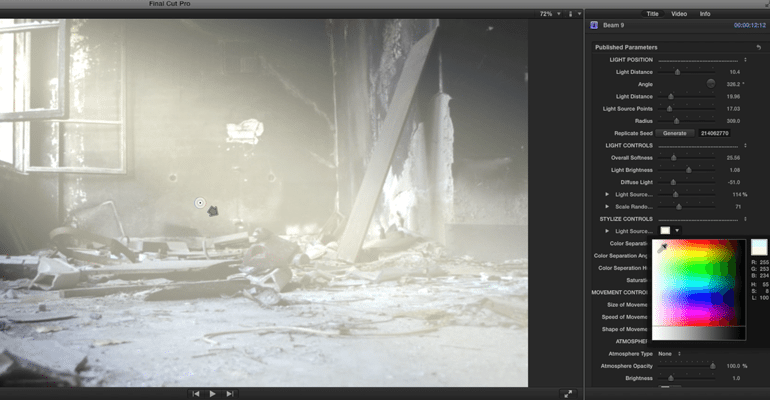 Then use the opacity, brightness, and color controls to blend the composite into the environment. Where do I find ProBeam? Once the installation is complete, you can find ProBeam in the FCPX Titles library. Is it possible to move the center of the light elsewhere in the frame? No, the light must always pass through the center. Can the movement of the light be keyframed? Yes, the movement can be keyframed.